SUBHEAD: It's just a part of the even greater tectonic phenomenon called the Ring of Fire. 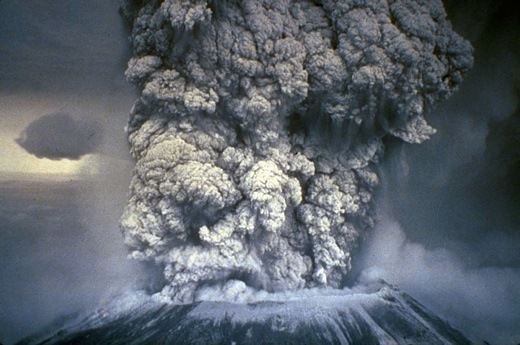 Image above: On May 18th 1980, Mount Saint Helens exploded and devastated hundreds of square miles around it. From (https://rarehistoricalphotos.com/eruption-mount-st-helens-1980/). Driving south on I-5 into Seattle, the Cascadia Subduction Zone came to mind, especially when the highway dipped into a gloomy tunnel beneath Seattle’s relatively new skyscraper district. This fault line runs along the Pacific coast from north of Vancouver down into California. The western “plates” move implacably east and downward under the North American plate, building up massive tectonic forces that can produce some of the most violent megathrust earthquakes on the planet. The zone also accounts for a chain of volcanoes that tend to produce titanic explosions rather than eruptions of lava and ash as seen in the hula movies. By all acounts Mazama was floating upon a vast lake of steamy rhyolite. It was a structurally unstable stratovolcano the size of Mount Shasta with a net volume of 80 cubic miles. A five minute Triple Junction 9.3 Richter Scale shaker uncorked the Mount Mazama champagne bottle via massive lahars which removed the overpressure. Geologists estimate that the eruption lasted for about one day. It’s only been in the last thirty years that Seattle hoisted up its tombstone cluster of several dozen office and condo towers. That’s what cities do these days to demonstrate their self-regard, and Seattle is perhaps America’s boomingest city, what with Microsoft’s and Amazon’s headquarters there — avatars of the digital economy. A megathrust earthquake there today would produce a scene that even the computer graphics artistes of Hollywood could not match for picturesque chaos. What were the city planners thinking when they signed off on those building plans? I survived the journey through the Seattle tunnel, dogged by neurotic fantasies, and headed south to California’s Bay Area, another seismic doomer zone. For sure I am not the only casual observer who gets the doomish vibe out there on the Left Coast. Even if you are oblivious to the geology of the place, there’s plenty to suggest a sense of impossibility for business-as-usual continuing much longer. I got that end-of-an-era feeling in California traffic, specifically driving toward San Francisco on the I-80 freeway out in the suburban asteroid belt of Contra Costa County, past the sinister oil refineries of Mococo and the dormitory sprawl of Walnut Creek, Orinda, and Lafayette. Things go on until they can’t, economist Herb Stein observed, back in the quaint old 20th century, as the USA revved up toward the final blowoff we’ve now entered. The shale oil “miracle” (so-called) has given even thoughtful adults the false impression that the California template for modern living will continue indefinitely. I’d give it less than five years now. The movers and shakers of that state dwell in an extra-special political bubble of their own that doesn’t accommodate much thought about the actual future in which all their recent investments in public infrastructure fail spectacularly. There will be no Tesla utopia of self-driving electric cars to “solve” the dilemmas of internal combustion, despite the prototype demonstrations among status-seeking tech executive millionaires. From the Berkeley highlands at night, you could see across the fabled bay to the twinkling new skyscrapers of San Francisco — like Seattle’s, another expression of the inordinate riches spawned by computers. How was that a good idea, considering what happened there as recently as 1906? What you see out there along the Pacific rim of the USA is a giant booby-trap of certain cataclysm. It’s part of the even greater tectonic phenomenon called the Ring of Fire, which circles the whole western ocean from the Aleutian Islands to Japan through Indonesia and up again along the western edge of South America. Things are livening up all over the darn thing right now, including the rumblings of a bunch of big volcanoes in the South Pacific and the Fuego volcano in Guatemala, uncorking lethally as I write. And, of course, none of the foregoing includes the giant magma dome of worthless stock and bond values swelling under the towers of Wall Street back east.